To fully understand the state of digital video advertising and its potential for news, it is helpful to start with the entire advertising picture. Total advertising revenue amounted to $171.3 billion in 2013, according to estimates provided by eMarketer. 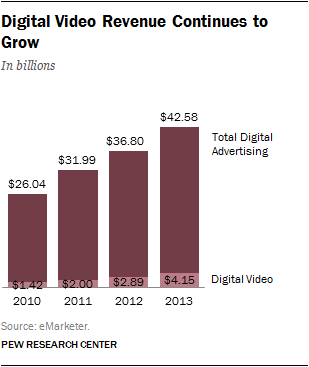 Digital advertising accounted for a quarter of that (or $42.6 billion). Digital video advertising amounts to just a small piece (9.7%) of all digital ad revenue – an estimated $4.15 billion. It accounts for an even smaller share of all advertising revenue across platforms – just 2.4%.Still, digital video advertising is growing rapidly at 43.5% year over year. By 2017, eMarketer projects that digital video advertising will make up 15% of the total digital advertising market. Indeed, much of this growth can be attributed to the price of digital video ads compared to more traditional kinds of online advertising like banners. One of most widely used metrics for measuring the price of a digital ad is CPM, or the cost per thousand views of the ad. And while some prefer other engagement based metrics like cost per click or cost per completion (where the ad only counts if the user actually watches it), CPM can still speak to broad differences in value for various types of digital ads. No firms break out these revenue estimates specifically for news. But a deep look at the playing field suggests that for organizations producing news video, this may be a difficult revenue environment. Pew Research has already documented in previous State of the News Media reports the degree to which online advertising over all – and more relevant to news, display advertising – quickly became dominated by a few big players. In the display ad market, about half of all the ad dollars go to five companies: Facebook, Google, Yahoo, Microsoft and AOL. The remaining 50% is what’s left for news organizations and thousands of other publishers. There is not yet an equivalent revenue pie for digital video, but the analytics firm comScore tracks which companies serve the most digital video ads to web users. These data, along with other indicators, offer three key findings. First is the degree to which YouTube (ranked No. 1 here as a Google site) already has a strong hold on the market, especially since it serves up its own ads through the Google ad network. Separate data from eMarketer project that YouTube will have generated $850 million in video advertising alone in 2013. That amounts to 20.5% of the $4.15 billion digital video advertising market. While it is up only slightly, from 19.7% in 2012, eMarketer projects YouTube’s percentage to grow to 23% by 2015. The second point revolves around the role of ad networks – the middle players in the digital ad space between the advertisers such as Honda or Prudential and the content publishers such as ESPN or The New York Times. 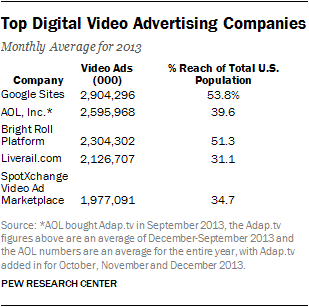 AOL is largely on the list because of its purchase of the ad network Adap.tv in 2013. And the remaining three –BrightRoll, LiveRail and SpotXchange – are all ad networks in their own right. The ads are sold by the ad networks, which then share the revenue with the host publisher. News organizations, in other words, need to share revenue with these ad networks. In addition, news organizations compete for interest from these networks with all kinds of other publishers such as Hulu or ESPN, many of which have higher market appeal. Perhaps most important, Facebook is only barely in this space. Facebook tested its first attempt at a video ad on Dec. 19, 2013.10 Consider that in the display advertising market, Facebook quickly became the top display ad selling company. In 2009, five years after its launch, Facebook was second to Yahoo, generating around $560 million in display ad revenue to Yahoo’s $1.26 billion. By 2013, Facebook was the No. 1 display video ad company in the U.S., generating $3.17 billion to Yahoo’s $1.27 billion. 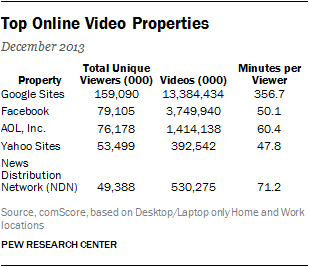 What’s more, when it comes to views of online video, Facebook already ranks near the top. It’s not that news is absent from Facebook or YouTube. To the contrary, half of Facebook users get news there at least sometimes, according to 2013 Pew Research data, and one in five YouTube users get news on that platform. CNN’s YouTube channel alone has more than 400,000 followers. But, in addition to the ad network sharing, news producers must share revenues with these distribution partners, which skims off a portion of the totals that were small to begin with compared with those of legacy platforms. Another drag on the incentive to innovate comes from the fact that for legacy producers of video news content, the vast majority of their revenue still comes from television. Fully 37% of total cable revenue, 81% of network revenue and 94% of local TV revenue come from legacy advertising. In addition, the cable news networks generate a substantial portion of their total revenue from fees received by cable providers, such as Comcast, which are then passed along to consumers in their cable bills. 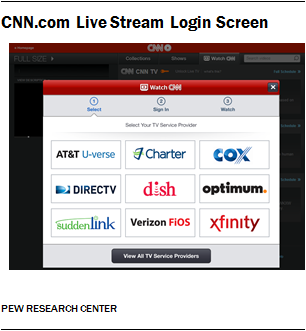 Indeed, while all three of the cable networks offer live streaming on their sites, they also all require users to sign in with their cable provider if they want to view the live TV stream on the web – to verify the user is already paying for a cable subscription.